Two weeks into its aftermath, all are aware of the horrific disaster that was Air France 447. 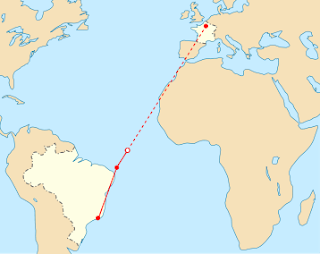 En route to Paris, France, from Rio de Janeiro, Brazil, it is believed that the airplane met a series of storms, called a Mesoscale convective system, never clearing the Atlantic Ocean. Below is an image, charting AF 447’s flight pattern (actual and planned), that I pulled down from Wikipedia. The clear dot marks the spot where communication was lost with the crew and plane. 216 passengers and 12 crew members, representing 34 nations, were aboard the Airbus 330-200. All lives were lost, and as of this writing, merely 50 bodies are recovered. AF 447’s black box, located in the plane’s tail, is not yet found, and could be as deep as 9,800 feet, resting on the mountainous ocean floor. Only two weeks remain before its "pinger" quits. Dying with the black box's signal would be any hope of telling evidence related to the crash. This is not the first aviation accident associated with Brazil. In fact, there have been several. Many remember the runway accident and explosion at São Paulo's inner city airport, Congonhas, in 2007, involving the Brazilian airline, TAM. There have been untold accidents in Brazil's Amazon Rainforest, one as recently as February of this year, killing 24 people. While it does have blemishes upon its name, Brazil’s role in aviation is rich. Rich in more ways than one. First, in its extreme wealth. Brazil's wealthy regularly charter aircraft across the country's cityscapes. This wealth contributes to its place as the third largest market for business aircraft. And second, in its history. Still today, the name of Albert Santos-Dumont, often called the “Father of Aviation,” is brought up in conversation among Brazilians, at times in a slight to the Wright Brothers. Adding significance to Santos-Dumont's prominance, Rio’s regional service airport bears his namesake. My grandfather, as a young man in the United States Navy, was stationed in Natal, Brazil until December 7, 1941, when Pearl Harbor was attacked. A neutral country for most of World War II, Brazil eventually declared war on Germany in late August, 1942, thus siding with the Allies. Natal is known as the “Corner of the Continent” and was, before and during the war, the largest US military base outside of its territory. This strategic position was set up to patrol the south and central waters of the Atlantic, mostly used for the monitoring of Germany’s U-boat activity. In 2003, I visited Natal, for myself, to get a sense for what it must have been like at that time. In the picture below, I am seated on a jet bound for Recife—prior to takeoff, of course. Perhaps the key component of Brazil's aerospace influence today is the once-nationalized and now-private conglomerate, Embraer, or Empresa Brasileira de Aeronáutica, S. A., which is one of the largest manufacturers of commercial, corporate and military jets. Also in 2003, I visited Embraer's São José dos Campos, São Paulo headquarters. A friend of mine and his dad are both employees of the company, and they invited me to check out the facility. The corporate campus was a scene, with its formidable workforce. In Flight 447, and for that matter, any aviation accident, it is not easy to find security. However, I have no doubt that, as for Brazil's future role in aviation, its continued presence is a safe bet.